Del. Patrick Hope is calling on Virginia lawmakers and Gov. Terry McAuliffe to pass a bill requiring universal background checks for gun sales conducted in the Commonweatlth. Spurred by the recent shooting in Roanoke, Virginia, Hope took to the Internet, creating a petition on Change.org about universal background checks. The petition received more than 20,000 signatures in the first 24 hours, Hope said. As of today, more than 28,000 people had signed. 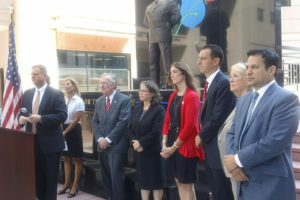 Hope joined seven other Virginia delegates at a press conference in front of the Arlington County courthouse Thursday, talking about the need for universal background checks. According to hope, universal background checks are an easy, noncontroversial measure that can be changed and most voters support them. “No responsible gun owner is afraid of a background check,” he said. Most Virginia residents believe that there is already a law in place requiring a background check before every gun sale, Hope said, which is not the case. Currently, there is a loophole in Virginia that doesn’t require background checks for sales at gun shows. Hope said he went to a gun show and asked if he could get a gun without a background check. Instead of raising red flags, the vendors were more than happy to help him. “It’s as easy as buying a pack of bubble gum,” he said. There will be legislation introduced in 2016 calling for the universal background checks, according to Hope, but it has to also pass the state Senate, which has killed gun control reforms in the past. The only difference between this year and next is that 2016 is an election year. “The only way we’re going to get legislators to change their minds is if the voters force them to,” he said. Universal background checks won’t prevent every tragedy, Hope said, pointing to the Roanoke shooting, where the shooter legally bought a gun, but it can prevent some. “If we can prevent one incident from occurring, then we should do it,” Hope said.